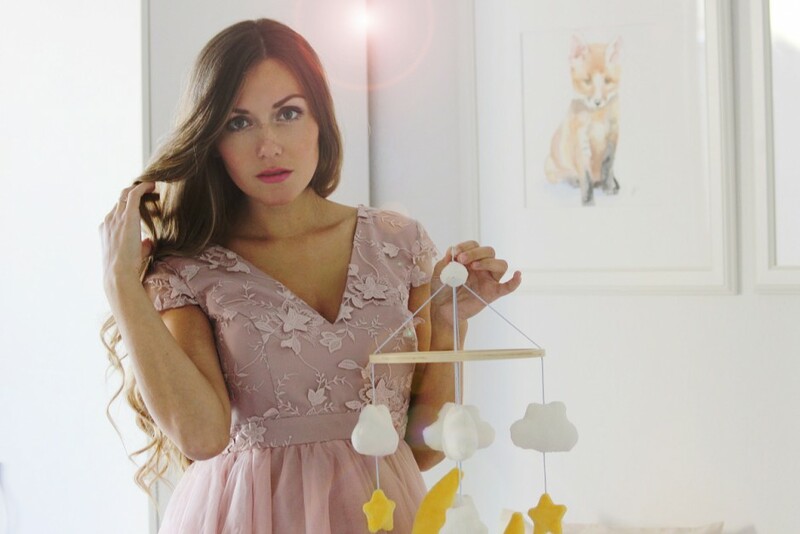 You all guys know how I am into baby stuff now and on the search for the awesome nursery must-haves. Recently I’ve read that 95% of parents now use a baby sleeping bag as an alternative to sheets and blankets. And I consider it to be the best solution, as it is super convenient to use – you just pop your baby into and then fasten it, so that your sweetie won’t slip out of it at night – and sleeping bags look just so cute! Even if they say blue is for a boy I really think this color fits amazing gender neutral. I love wearing blue myself, so pink sleeping bag for my angel has never been an option for me. 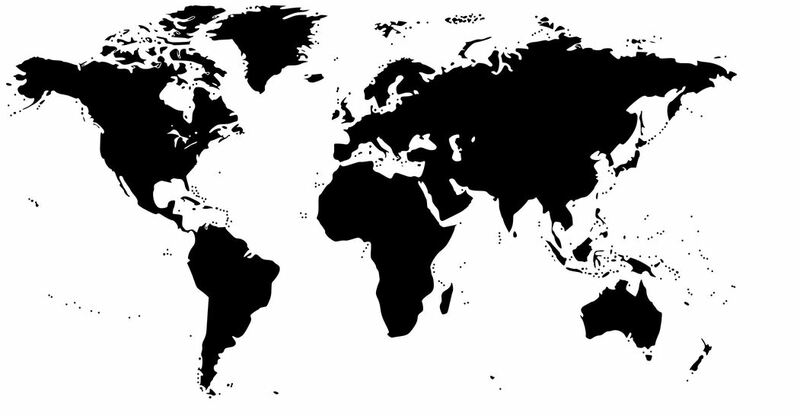 I chose the cloud-sky version from Tchibo and like it loads. It looks gorgeous hanging in my baby’s bedroom. 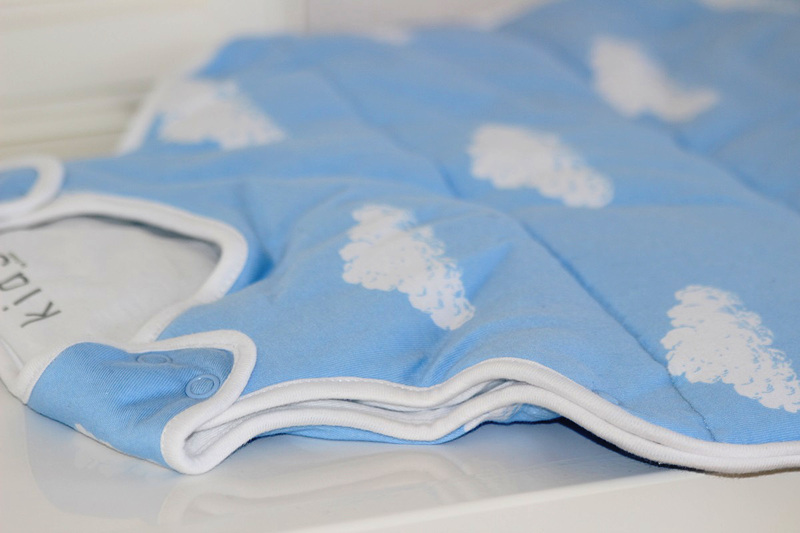 I love natural cotton quality and luxuries feel for reasonable price! I would definitely recommend it also as a gift. The essential thing I’ve learnt is that the sleeping bag has to fit really well – to avoid your baby slipping down inside the bag, so make sure it fits properly around the neck and arms! Of course it the early stages of life your baby is going to spend most of the time laying on his back. And it could get pretty boring soon, that’s why I decided to install a cute baby mobile to give my little one both entertain and calming! It moves, sways and jiggles and has a detachable soft toy to cuddle. I prefer ceiling mounted wooden baby-mobiles with a slight vintage vibe over modern plastic crib mounted baby mobiles. 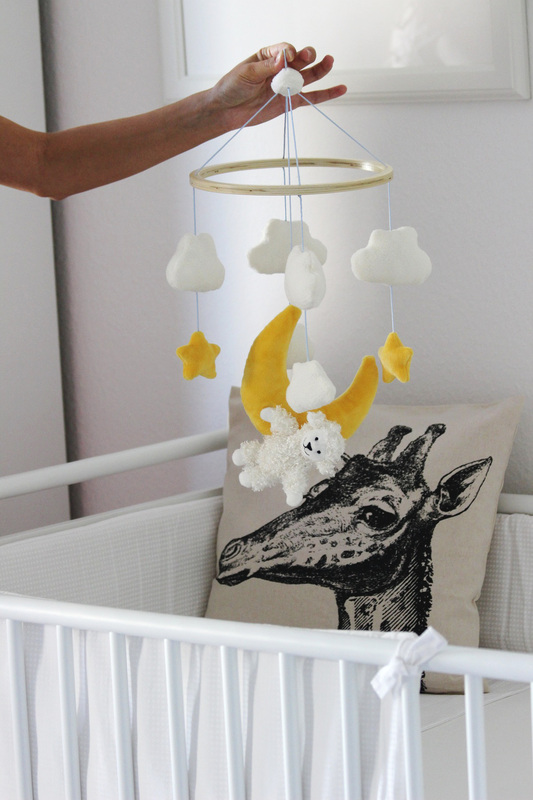 And as the nursery theme is pretty natural with loads of animals incorporated this Tchibo mobile continues a running theme throughout it. My tip is – be sure to check out how your mobile looks like hanging above your head. It has to entertain your baby, so if it is less exciting from this angle probably your baby won’t be excited too. 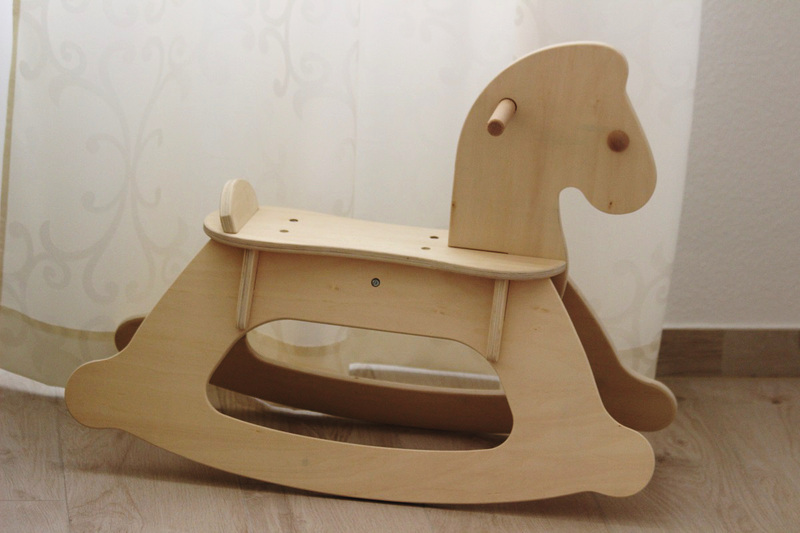 And last but not least let me introduce you the decorative part of the nursery for a newborn but an absolute must-have for a toddler – the rocking horse! There’s a reason why rocking horses have been a staple of children’s nurseries for years – kids adore them. My mom still has a picture of me on a rocking horse with the happiest face on shot by my dad. 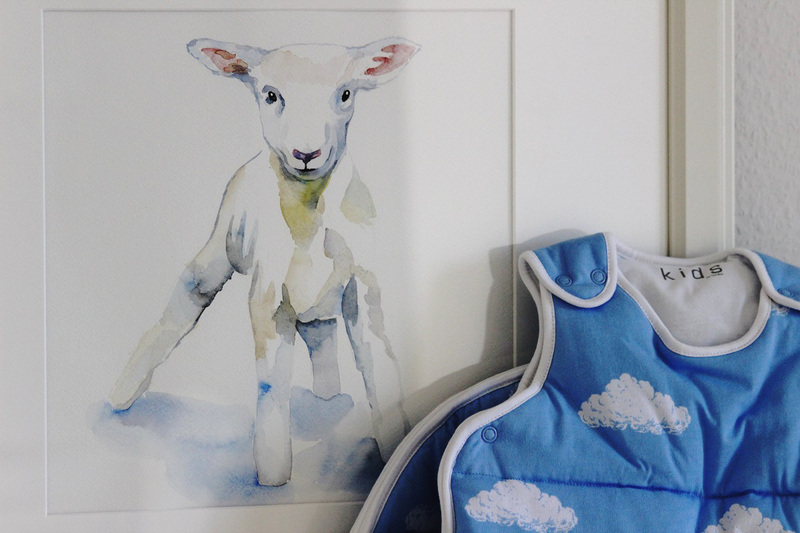 For the nursery I wanted the one with a timeless charm and made of 100% natural material, non-toxic and baby-friendly – wood. 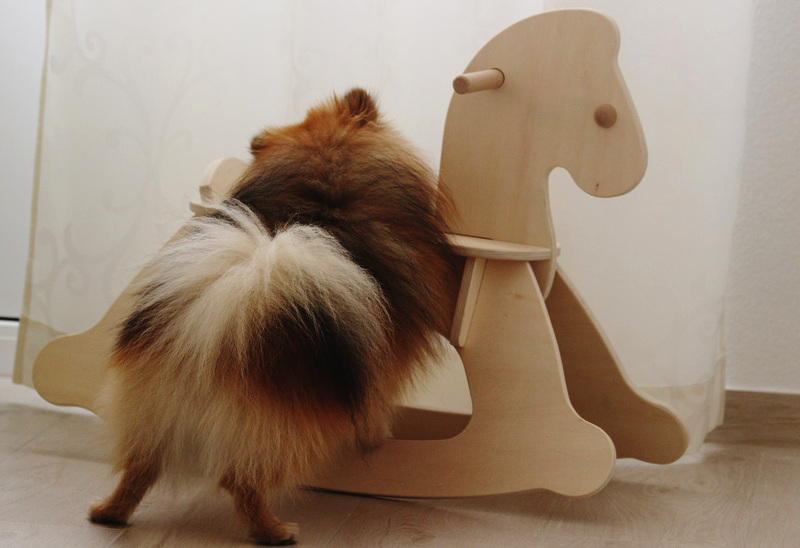 It is just like the classic wooden rocking horse you had while growing up. It is perfect while developing basic balance and coordination skills. Hope you find this review helpful to make your choice. You can find loads of awesome babystuff from Tchibo here and also check out their cute pregnancy basics.